I'm so excited to share my new Cricut Maker with you! Honestly, I've been quite content to ask my friends with cutting machines to do all my cutting for me. Until now, that is! 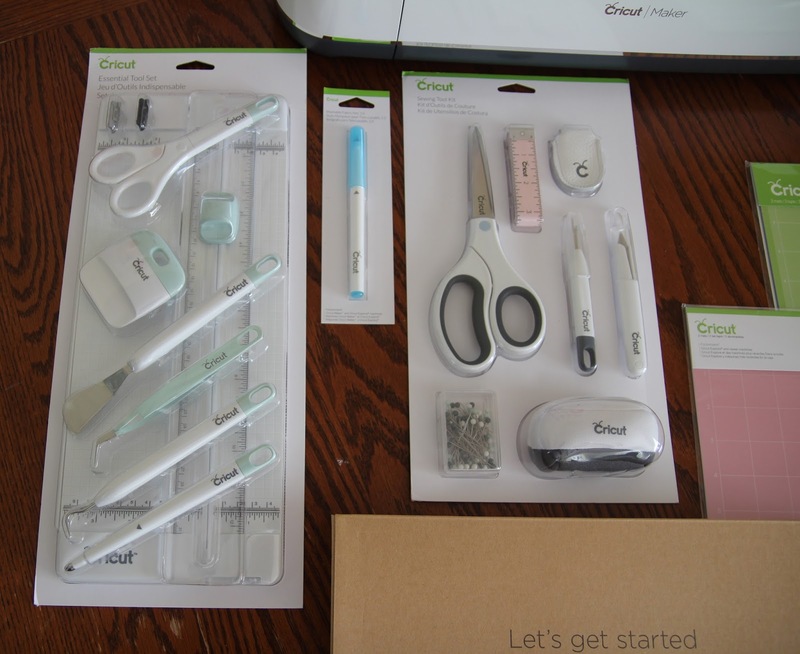 When I found out that there was a new Cricut machine that would be able to cut fabric with a mini rotary cutter, I had to have one to add to my sewing arsenal. I chose the Cricut Maker because of it's capabilities. It has something called the adaptive tool system. Basically what that means is that you can use different blades to cut all different kinds of materials in many different thicknesses. The rotary blade can cut through virtually any fabric because it rolls/glides along. The knife blade that will be released later this year will be able to cut through things like chipboard, mat board, or even balsa wood. 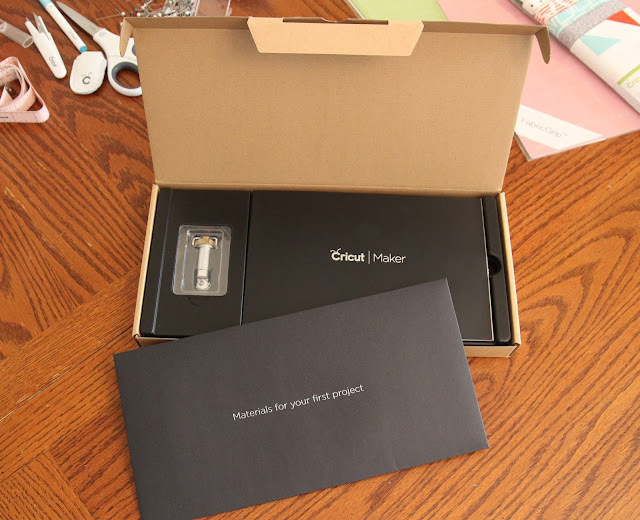 I have to admit that even though I was excited to get the new Cricut Maker, I was nervous about using it. I wasn't sure if I could figure out how to use it. I had never used a cutting machine before, but I wanted to try. 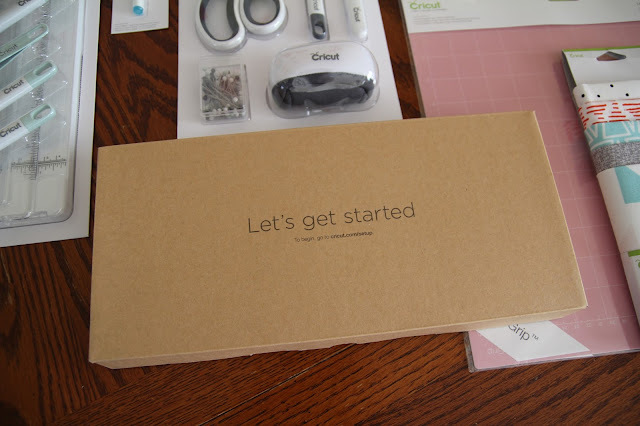 When I first opened the box, I was so excited to see this little "Let's get started" box right on top. The very first thing that you see is "To begin, go to circuit.com/setup". Included are all the materials to get you going on your first project, including the rotary blade. It was so cool to see the cutting in action! 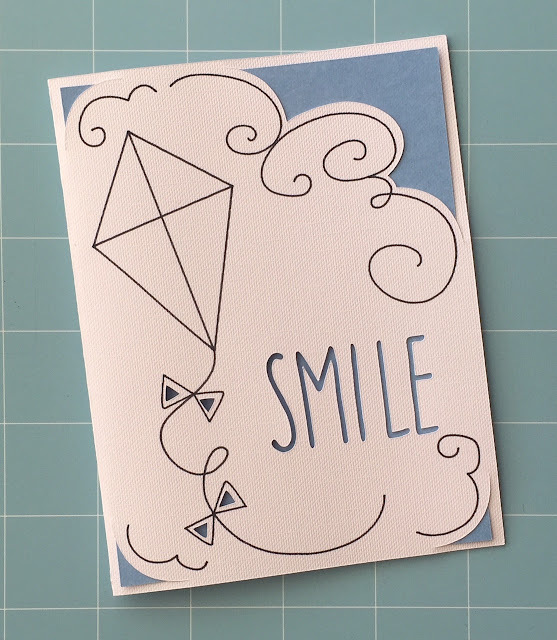 As soon as I started the setup, I was completely at ease, and was enjoying myself as I made my first card. I love the professional level of the cutting and the fact that anyone could use it. I love the freedom I now have to make these things myself. I knew I would want all the tools to help me with my sewing projects as well as paper projects. 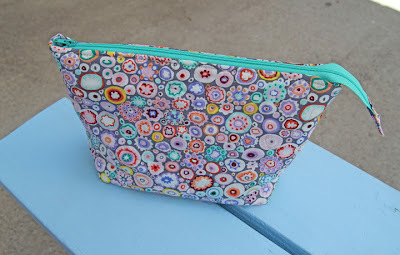 The sewing tool kit is the perfect "refresher" tool set for someone who already has a lot of sewing equipment, and the washable fabric pen is a must have for the patterns I plan to cut. Seriously though, that pink tape measure is my favorite thing of all! So cute! The essential tool set has everything needed for paper crafting, and fits nicely in the cubbies at the side of the machine. Also included in the essential tool set is the paper trimmer. I love this thing! I've already used it to trim the edges off my PDF patterns so I can tape them together more easily. 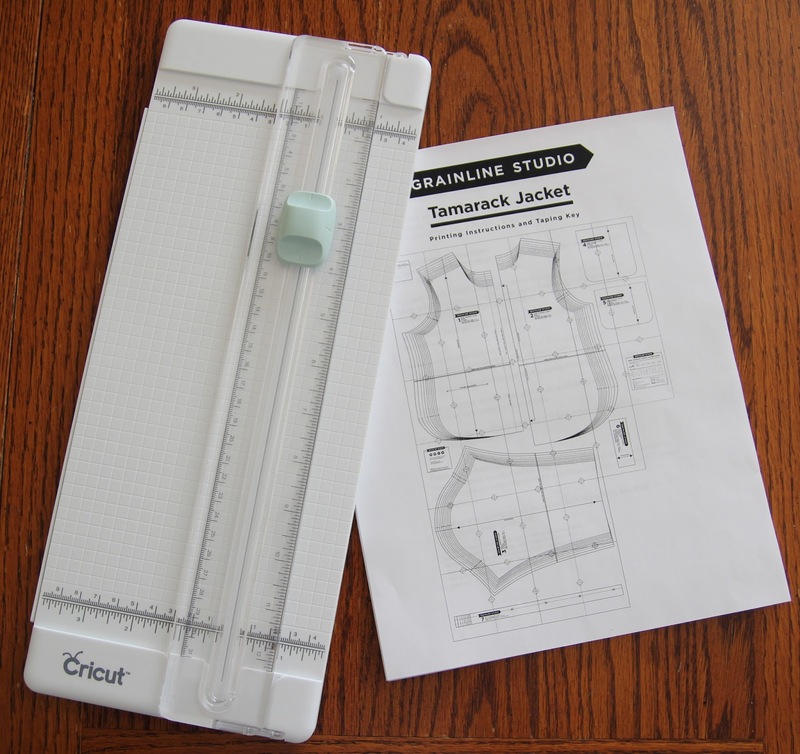 I'm looking forward to using the patterns from Simplicity and Riley Blake that can be found in the sewing pattern library in Cricut Design Space. These sewing and quilting patterns can be cut and marked in just minutes! 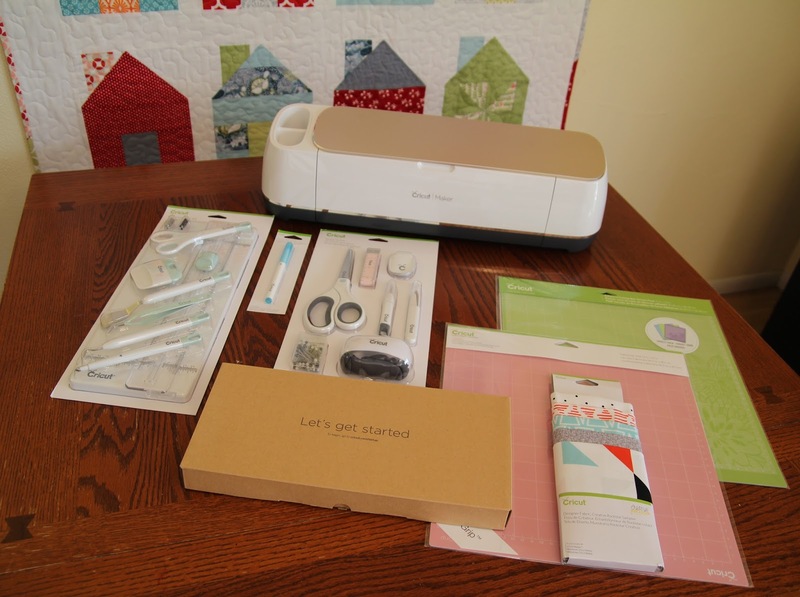 Overall, the Cricut Maker is a beautiful machine and is so easy to use. I can't wait to explore more projects in Cricut Design Space, possibly creating some of my own designs, and getting started on my first sewing project!